Having an outdoor gathering everyone should be equipped with a Torch Stakes and Snap Pour Spout bundle which includes 4 metal torch stakes and 1 Snap & Pour Spout. The outdoor tiki torch stake bundle makes setting up your tiki torches and filling them up easy. Ideal gift for the outdoor party, outdoor wedding, pool party or any outdoor gathering. PERFECT OUTDOOR TORCH BUNDLE: Tiki Torch Bundle includes 4 metal torch stakes and 1 Snap and Pour Filling Accessory. EASE OF USE: Having the right tools always makes it easier. Tiki torch stakes making placement of your torches easy and securely. Stakes are adjustable to hold bamboo or metal outdoor torches. Snap and Pour Spout makes pouring your fuel easy. 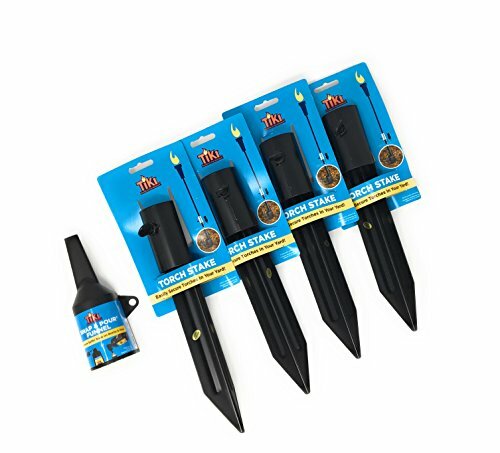 100% SATISFACTION GUARANTEE: We are confident you will find the torch stakes and snap and pour spout will make setting up your outdoor torches easy. But if for any reason you are not completely satisfied with Torch Stakes Bundle, we will refund your purchase.